As a native of Illinois, although not of Chicago, I’ve had Chicago-style deep dish pizza a few times in my life, mostly in the Midwest. Only a couple of times have I had it in California that I recall: once at a Pizzeria (or maybe Numero) Uno outlet in San Francisco, and once three years ago in Placentia. It’s pretty rare out here. 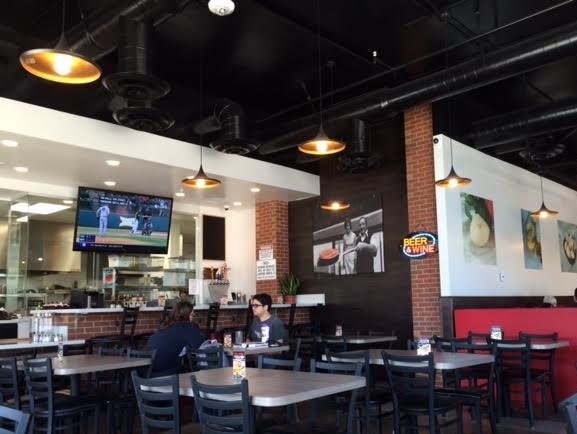 But a few months ago, a Nancy’s opened in La Verne in the mixed-use La Verne Village center on Foothill that used to be the site of Person Ford. I’d never heard of Nancy’s, but they’re based in Chicago, and they claim to have invented the stuffed pizza in 1971. Evidently, deep dish was invented in the ’40s or ’50s, and the stuffed pizza claimants are Nancy’s and Giordano’s, in the ’70s, the difference being “deeper topping density,” according to Wikipedia. I delayed visiting in part because I wasn’t sure Nancy’s was legit, and also because going out solo for deep dish pizza is an undertaking, like scaling Everest. Finally I dropped in for lunch on a recent weekend. There’s a visit to Chicago in my near future and I had to get in shape. Unless you’re ordering to go, you take a seat. The menu has salads, sandwiches, pasta, cannoli and pizza in several varieties, including thin crust and pan pizza. 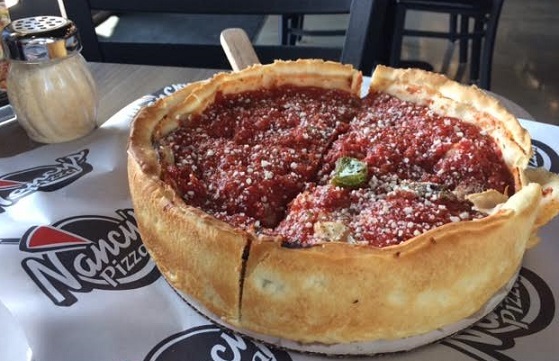 The waitress explained that the stuffed pizza — the one described as 2 1/2 inches tall — is the traditional Chicago style with the toppings inside. (More to the point, as I read later, under the top layer of sauce it’s got a thin layer of crust, besides the bottom layer, which is why it’s described as stuffed.) So I got one of those, a small Rocco’s party pizza, with sausage, mushrooms, onions and green peppers ($23). It arrived after about 20 minutes, fairly speedy for pizza this thick. 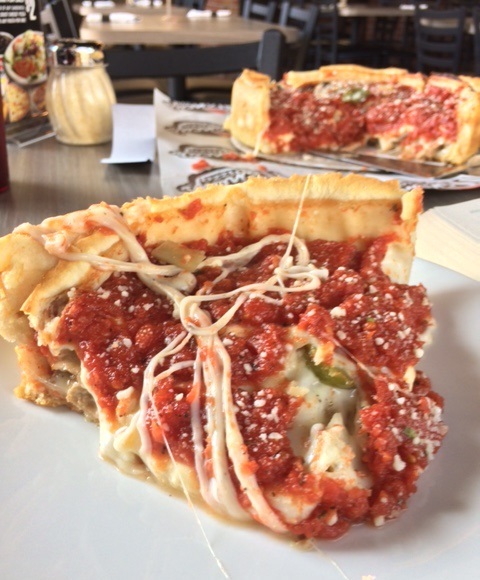 If you haven’t had Chicago-style pizza before, you might think, $23 for a small? But take a look at the photo, with the parmesan dispenser included for perspective. The pizza is almost as tall as the dispenser. I was hungry and could eat only two slices. The rest was taken home and consumed over two meals. This was pretty good pizza, perhaps not as good as Tony’s in Placentia but with the crisp, buttery crust and high edges that fans love. I would go back. Update July 2016: And I have. Having run out of time to get an Italian beef sandwich in Chicago, I got one in La Verne. Oh, that garlic bread. 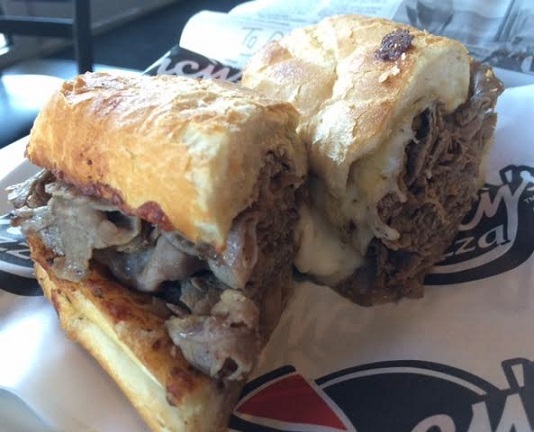 This was an excellent sandwich. 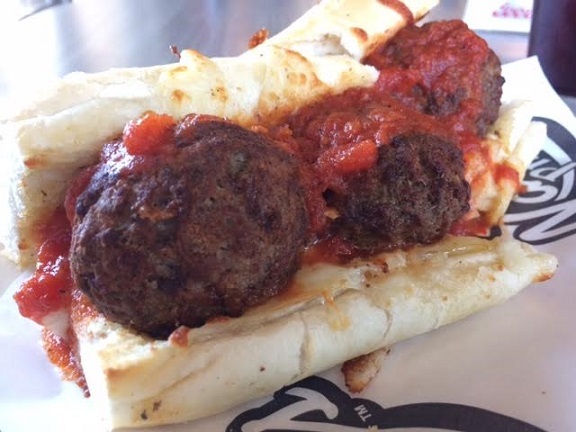 Also tried the meatball sub, another winner. This entry was posted in Restaurants: La Verne and tagged Chicago-style, La Verne, pizza, restaurants by David Allen. Bookmark the permalink. Typo. “invited” should be “invented”. I still remember my first Chicago deep dish pizza in downtown Chicago. Good to know I can try one here and save train fare to Illinois. The Inland Valley: Expanding to Serve You Better! You seem to be eating a LOT of pizza lately 🙂 Perhaps time to try a salad place? Because I’m doing my Eating Garey Avenue thing, I’ve had more pizza this year than I think I’ve had any year since college, and it’s only June, with several more pizzas to be had along Garey. I feel the waistline!! I always eat a lot of pizza — but it’s happened to show up on the blog twice recently. You can tell I have a sophisticated palate because pizza is my favorite food. Your Eating Garey blog was added recently to my Other Sites of Interest list on the right-hand side of this blog. John’s trying to eat at every restaurant on Pomona’s Garey Avenue, south to north, in order, one place a week. Yet another good pizza place in La Verne. What is it about this city that attracts so many quality pizza producers, not including the major chains? Have not had a chance to try Nancy’s due to a recent job (and residence) relocation, but from the above it appears to be a worthy addition to the Pizza hub of the Inland Valley. 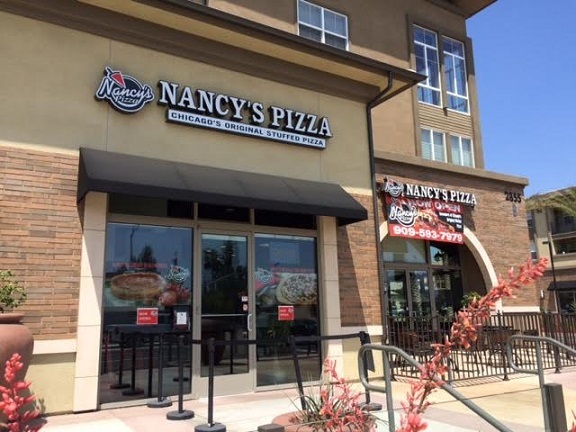 It is surprising that the first Nancy’s in California is in La Verne, but you’re right, it’s a great pizza town, for whatever reason. Try Hollywood Pies in DTLA. Some people have said it’s comparable to Malnati’s, and that other pizzeria that is famous for deep dish. New ownership now so don’t know if it’s still the same. It took them in the past almost an hour to make one. Guy who owned it made the sauce fresh in house, and same for the mozzarella. Note to self jotted, thanks.